Carmelo Anthony is hopeful that he’ll be able to play in tomorrow’s big Christmas game against the Oklahoma City Thunder, but cautioned that the ankle injury he suffered against the Orlando Magic Monday night makes it a game-time decision. Anthony, who’s second behind Kevin Durant in league scoring this year, explained that the ankle roll was not as severe as it could have been. “I’m walking. 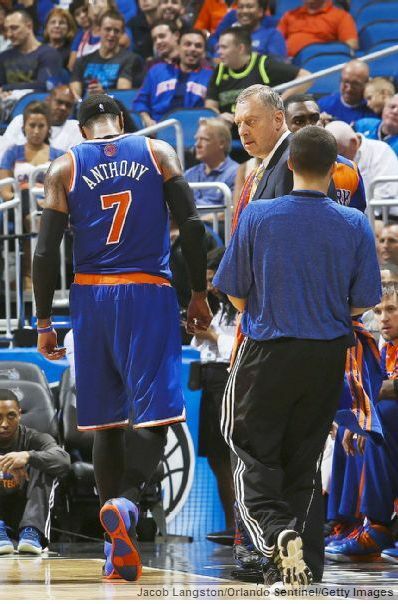 I caught it before I rolled it all the way but it rolled pretty bad,” Anthony told the New York Post. Anthony went up for an offensive rebound in the third quarter and landed awkwardly on a Magic player Tobias Harris, resulting in the rolled ankle. He received treatment on the bench and did not return to the game despite going to the locker room under his own power. The Knicks and Thunder last met in April in a wild shootout game that saw the Knicks win behind Anthony’s 36 points and 12 rebounds. Durant chipped in 27 points. The win allowed Anthony to take the #1 scoring spot and eventually win the league scoring title. Much as I’d love to see another Melo-Durant duel, I’d rather our best player sit this one out and get healthy. He’s been playing way too many minutes as it is and trying to guard Durant on a bum ankle will do his health no favors. As we saw in last night’s Magic game, this team is hopeless without him, so risking a situation where he has to miss further time is not smart. With that said, Melo is a baller and since he’s been here, he’s always loved these Christmas games. I give it a 70% chance that he ends up trying to play.